Located just south of Nags Head, Coquina Beach is a refreshingly undeveloped stretch of shoreline that's close to the central Outer Banks towns of Kill Devil Hills, Nags Head, and Kitty Hawk, but feels like it's miles away. Coquina Beach is located along NC Highway 12, approximately 8 miles south of the Nags Head town borders, and is part of the Cape Hatteras National Seashore. 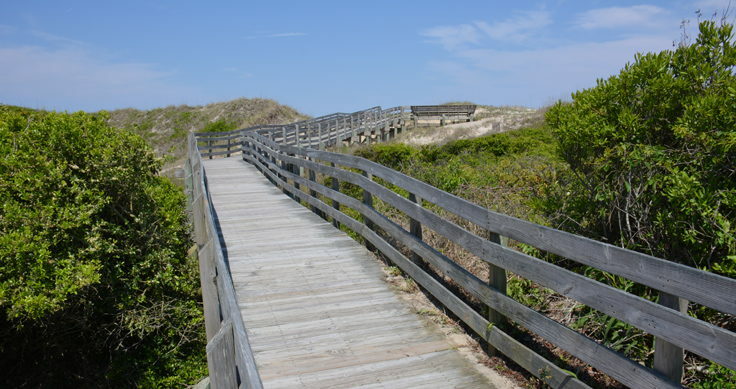 As a result, the beach is completely free of commercial development, allowing beach-goers to enjoy endless stretches of sand from the ocean to the natural dune line. Visitors can access Coquina beach on foot or via a 4WD vehicle. 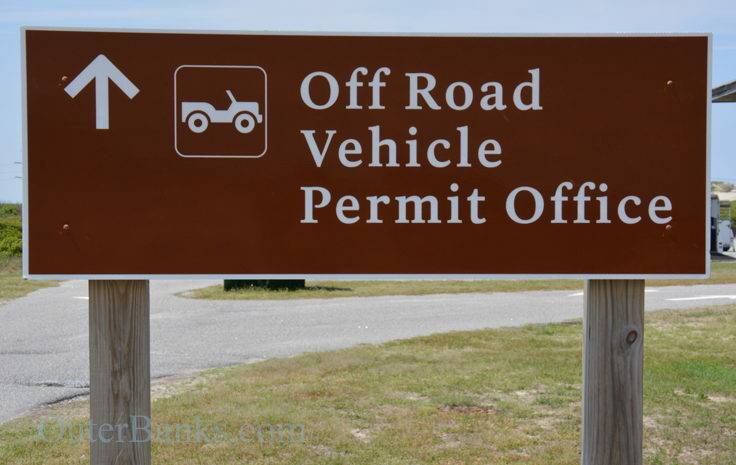 In order to drive on this beach, visitors will need to stop by the National Park Service ORV Permit Office, (located close to the NPS campground and Oregon Inlet Fishing Center.) 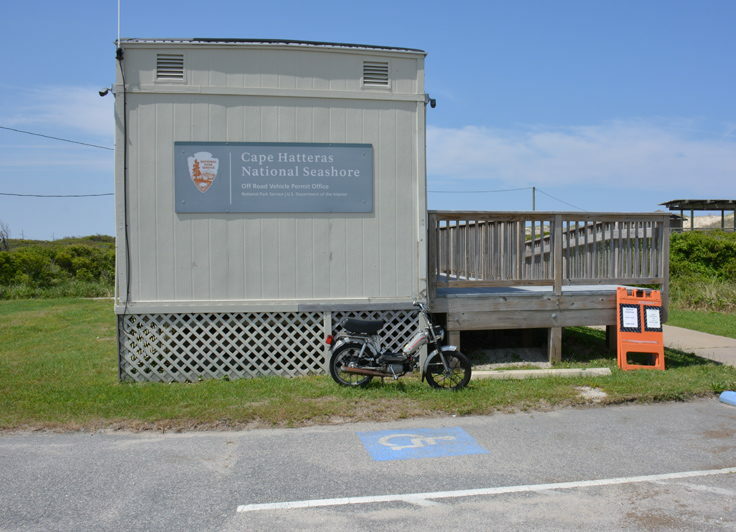 Once there, applicants will need to show required documentation, (which includes a valid driver's license and vehicle registration), fill out the permit paperwork, and watch a 7-minute video on driving on the Outer Banks beaches. Beach Driving Permits are available on weekly or annual basis, and generally cost around $50 for a weekly permit and $120 for an annual permit. 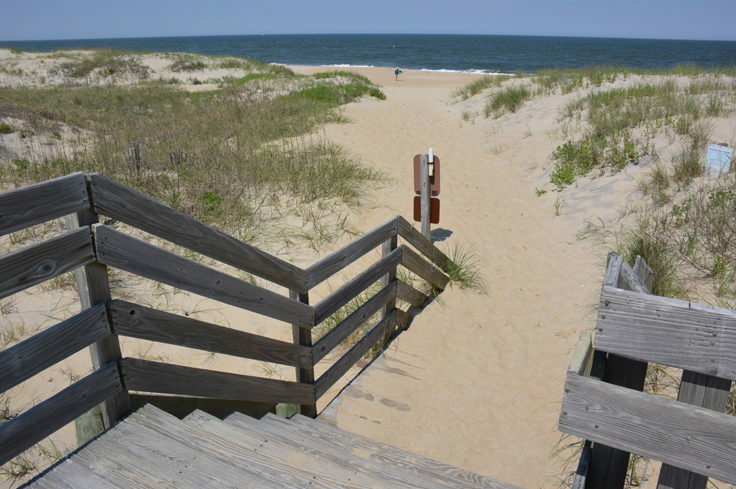 Visitors can also order and obtain their beach driving permit before arriving on the Outer Banks online at http://www.recreation.gov/showPage.do?name=common&commonPath=/htm/CapeHatteras_Form.jsp. 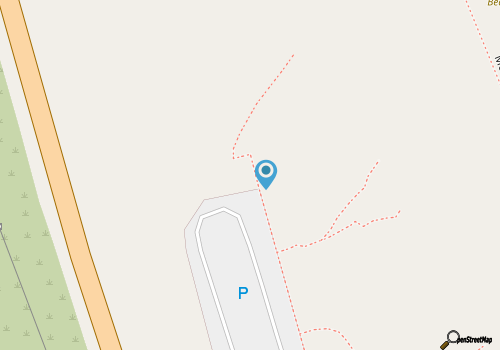 Note that once ordered, permits can be either picked up at the local NPS office, or can be shipped to the applicant's mailing address for an extra fee. Visitors on foot can also access Coquina Beach via a relatively easy walk from the public parking areas that are adjacent to the two 4WD beach access ramps, or via a small and unmarked oceanside parking area that's located just past Park Service Road. Pedestrians will want to keep an eye out for passing beach traffic, and stick close to the shoreline, away from the established sand tracks that serve as the "road" through Coquina Beach. Coquina beach was essentially named after the colorful coquina clams that are commonly spotted along the ocean wash of the Outer Banks, and can appear in abundance in the warm spring and summer months. The beach has a local claim to fame as the final resting place of the shipwreck Laura Barnes, a four-masted schooner from Maine that was driven onshore in June of 1921. While the entire crew was rescued by the brave Bodie Island Lifesaving Station personnel, the ship itself was lost to rough surf and battering waves, and remained stuck and grounded along the Coquina Beach coastline. While many of the materials of the Laura Barnes would eventually be stripped, salvaged or sold at auction, pieces of the ship still remain, both by Coquina Beach, and about a mile south across from the Bodie Island Lighthouse. Coquina Beach visitors will find plenty of ways to stay entertained beside the obvious preoccupation of stretching out in a beach chair and admiring the wide open views. 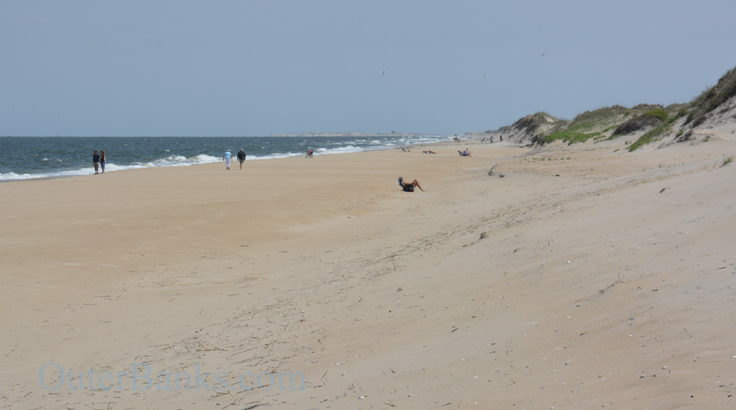 This section of shoreline is famous in the Central Outer Banks region for surf fishing, as the 4WD access makes it easy for anglers to haul along their rods, reels, tackle and coolers with ease. The fishing is at its best in the fall and spring seasons, which is considered prime surf fishing time throughout the OBX, but virtually any visitor has a good chance of reeling in a bluefish, mullet, or other regular local catches from this rarely-crowded stretch of beach. Beachcombing and shelling are also popular activities, as the shoreline's remote setting and proximity to Oregon Inlet can often produce some solid North Carolina finds. Colorful scallops and coquinas, clam shells, jingle shells, moon snails and whelks can all be found along this beach, especially 1-3 days after a regional storm. Sea glass also washes up on occasion, and certain years can even produce the occasional whelk or stingray egg case, starfish, or even sand dollar. 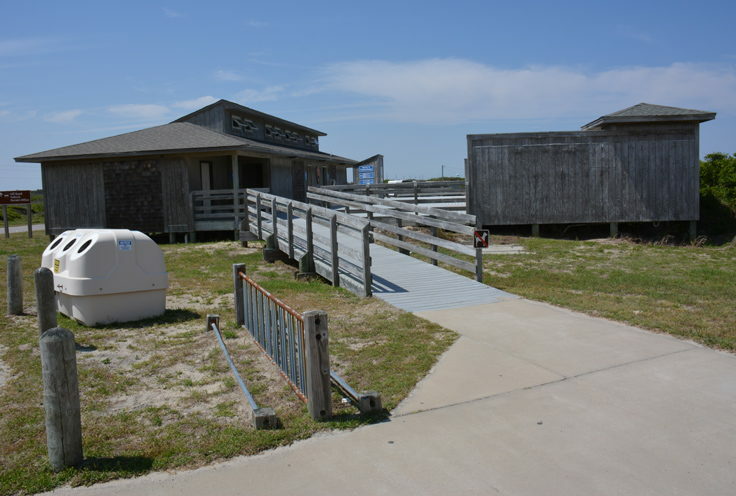 In the prime summer months, devoted beachcombers will want to make sure they hit the beach early, (particularly if low tide is in the morning), as this region can get popular with locals and visitors alike when the shelling is good. Surfing and body boarding can typically be enjoyed along Coquina Beach as well, especially when an offshore hurricane or nor'easter produces a local swell. Neighboring Nags Head is considered one of the top surfing destinations in the Central Outer Banks, (and is even the semi-regular home of the Eastern Surfing Association's championships, the ESAs), so boarders who want to be close to the action, but in a more remote spot with less competition, will adore Coquina Beach. Just be on the lookout for fishing lines when paddling out and riding in, as this beach can be very popular with surf fishermen as well. Birdwatchers who want to cross a number of Mid-Atlantic shorebirds off their list will appreciate Coquina Beach too, as the generally uncrowded shoreline is appealing to a wide range of feathered beach-goers as well, including plovers, sandpipers, cormorants and gulls. The late fall and early spring seasons are an especially good timeframe to catch these local species in their natural environment, while enjoying Coquina Beach virtually all to oneself. 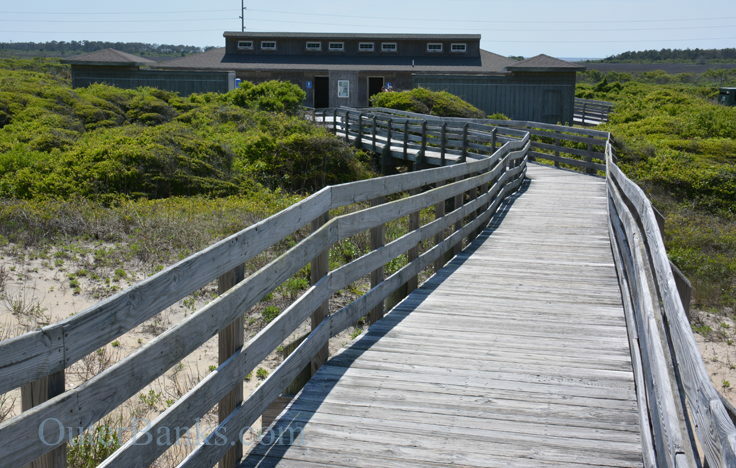 Close to the popular attractions, restaurants and shopping plazas along the Beach Bypass, but devoid of the crowds that flock to the Central Outer Banks, Coquina Beach is a perfect destination for vacationers who love a shoreline with plenty of elbow room. Pick up a Beach Driving permit at the local NPS office, or park at any of the multiple parking areas in between South Nags Head and Oregon Inlet, and enjoy a long walk along one of the OBX's prettiest stretches of undeveloped, natural coastline.